I am not a big fan of cold weather, so I am not disappointed that it will be warm and sunny today. I grew up with tropical Christmases and Santas on surfboards. Speaking of which, Roo has never been into sitting on Santa's lap. Take this picture from a couple of years ago. She talked about going to see Santa for days and then flipped out when actually confronted by the old guy. She was totally fine moments after being removed from his vicinity. This year, she's way more comfortable with Santa. She was a little shy at first but then regaled him with song, stories, etc. She even told him "my brother is really good at drawing!" which I thought was super sweet. I am writing this waiting for Roo to wake up so we can start the day. Jasper has been up for two hours already but seems totally non-plussed about the presents surrounding the tree. I am sure that things will be different next year! Hmm I tried to comment a second ago but Google said I did it wrong. Merry Christmas Naomi and family! The kiddos are so cute! I sure hope Santa brought you a well deserved surprise too! Love the pictures! Your little darlings are just beautiful. Hoping you had a wonderful Christmas!! Awwww...that brother sister love gets me every time. Sweet as can be. Visiting from 5 Minutes for Mom. 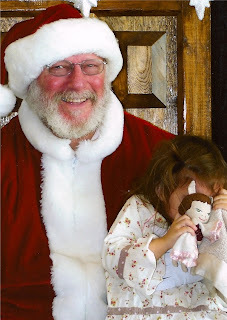 Love your Santa pictures - the little ones are always so skeptical. I think it's cute that your kids still sleep in on Christmas. Mine were up at 6am!